This is the ultimate guide to finding the best pressure washers in 2019. This is NOT a lame “Pressure Washers” review post. Instead, you’re going to see thoroughly reviewed products with their technical specification including a buyer’s guide to make your buying experience more straightforward. For those who do not know, pressure washers are high powered washers that use water to clean a lot of different types of equipment. They are used to remove dirt, grime quickly, and even paint that is chipping away. The pressure washers have become a lot more common in the modern day and age, and are available to the consumers at competitive prices, and offer many features as well. However, the abundance of pressure washers can lead to many confusions among the consumers as there are so many options to choose from, and not everyone is willing to go through all of them. This is why I have created the list; the list will contain some of the best pressure washers of 2019 that are available in the market, and will undoubtedly help the readers choose the right pressure washer, and buy that. As always, the list includes some of the highest end pressure washers, and in addition to that, some mid-range options as well, making things much more comfortable for the consumers, and helping them make the right decision. NOTE: Choose the right pressure washer nozzle to ensure you don’t damage the surface or hurt yourself. We have looked thoroughly at all the options that are on the list and can assure you that your buying experience will be as smooth as possible. Let’s have a look. Move it around easily with wheels on the rear. Clean your driveways, vehicles, and decks with ease. Comes with a water inlet with great maximum temperature. Has 20 feet of high-pressure hose, along with a 35 feet power cord for easier access. A great, multi-purpose pressure washer that has enough power to take care of every task you throw at it. The first pressure washer we are looking at is the Sun Joe SPX3000, and it right away, I have to say that it is one of the easiest to use pressure washers that is also packed with versatility, making things easier for you. The pressure washer comes with several features that make it stand out from the crowd, and earn a spot on the list. Sturdy Motor: The SPX3000 has a powerful 5 amp, and 1,800-watt motor that ensures proper cleaning. Wand Holder: Comes with a wand holder that allows you to focus the pressure of the water to where you want it to be. Detergent Selector: Has a unique feature known as the detergent dial that lets you choose the detergent you want to use. Light Weight: The SPX3000 is one of the lightest pressure washers, making things much easier for the user. The SPX3000 is incredibly lightweight, meaning that the user will not have to face any issue trying to carry the pressure washer around, or even try to a put it back in its place; this is a great feature that is a must-have. Another thing I love about the SPX300 is obviously the detergent selector, over the course of all the pressure washers I have used. The detergent selector allows you to select whatever cleaning agent you want to use for the best possible results. Another thing I love about the SPX3000 is the fact that the 1,800-watt motor allows it to give an output of 2,030 PSI, and a 1.76 GPM of water flow. These numbers result in incredibly powerful cleaning efficiency. The extension wand that comes with it ensures better range, especially when it comes to cleaning ceilings with great ease, this is just one of the many accessories that you get in the package. I cannot say that many things are missing from the Sun Joe SPX3000; as a matter of fact, it nearly is a complete package, but I wish that the nozzle through which the water comes out could be wider to allow for covering more surface when cleaning. What makes Sun Joe SPX3000 the best electric pressure washer? Features such as a powerful motor, lightweight construction, and detergent selector make the SPX3000 the best pressure washers available in the market. It is a beautiful pressure washer that gets the job done in every single situation, and will not disappoint. Incredibly powerful motor that allows for efficient cleaning. 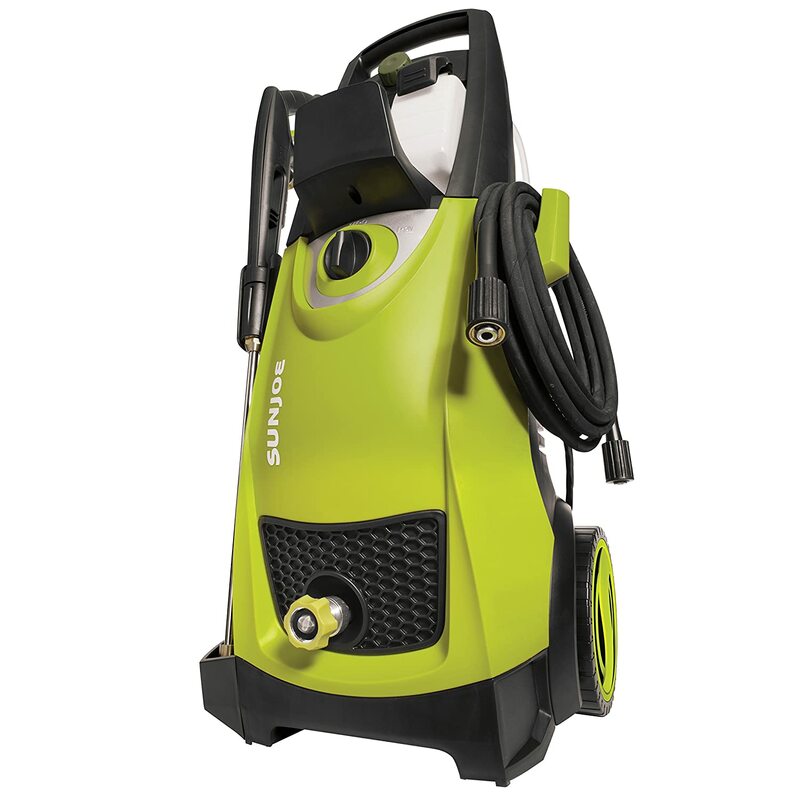 Lightweight construction allows the user to carry the pressure washer wherever they want. Detergent select feature is unique, and nicely integrated, allowing for the maximum ease of use. Comes with a slew of accessories like an extension spray wand that makes cleaning ceilings easier. The nozzle through which water comes out is a bit on the narrower side, which makes it cover smaller surface area. Has a 20-foot hose that gives you high pressure. The spray gun comes with enormous pressure as well. The lance comes equipped with turbo spray technology, allowing it to spray even better. The washer comes equipped with a 14-ounce detergent bottle, making it easier for you to clean. The A383 is a beautiful pressure washer that aims to deliver perfect performance for home chores. Next up, we are looking at the AR Blue Clean AR383, a pressure washer that is for people who are not looking to spend much money but still want something powerful enough to get the job done for them. The AR383 does not come with any advanced features but has enough basic ones that will allow you to clean your home efficiently. Good Hardware: The AR383 comes with a 1,900 PSI and a 1.5 GPM rating. Excellent Pump Design: The AR383’s pump design is based on the triplex three axial-piston, allowing it high performance. Increased Mobility: The 30 feet power cord, combined with 20 feet hose provides excellent mobility. Hose Reel: When not in use, you can holster the hose using the hose reel, which prevents any clutter. Attachments: Another great feature about the AR383 is that it comes with a plethora of accessories that will make your cleaning experience much more comfortable. Now that we have looked at the feature let’s see just how much of the AR Blue Clean AR383 is admirable; for starters, the star of the show is the motor, of course. The engine is capable of delivering a 1.5 GPM, combined with 1,900 PSI. While it is not the most potent motor found in a pressure washer, you have to look at the price as well, because it is one of the cheaper, more budget-friendly models available. Another great thing about this pressure washer is the number of attachments that come with it. You get a pressure washer gun, pressure washer hands, as well as a detergent bottle, and two high-pressure quick change wands that have variable nozzles. All of these attachments add a great value to the already fantastic pressure washer and makes things super easy for anyone who is looking for a good cleaning experience. For starters, I admire that there is a hose reel, but the hose itself is on the stiffer side and can get tangled easily. In addition to that, the washers for adapters feel a bit flimsy when you use them, but nothing too major, and they do not fall off either. One thing I have seen many users complain in pressure washers is that they are heavy; well, lucky for you, the AR383 is one of the lighter weight pressure washers available in the market, this allows the user to easily carry the washer anywhere they want and set it up for use. While the feature might be a gimmick to some, I find it useful as it allowed me to properly clean the house whenever I wanted to. Overall, the AR Blue Clean AR383 is a wonderful option for a pressure washer that you should definitely buy. Especially if you are on a budget, and you are looking for something that gets the job done without breaking the bank. Washer is easy to carry, and use. Motor is sturdy enough for decent output. There are plenty of attachments included that will make your experience much better. The hose is a bit stiff. Comes with great pneumatic tires. Powerful pressure thanks to the gas power. Has a spray gun that makes it a treat to use. Welded steel construction makes it a great choice. The SIMPSON Cleaning MSH3125-S is for people who want the most features, and a lot of power as well. Simpson has always been one of my go-to brands whenever it came to power tools. Their consistent quality has kept me coming back for more, and the SIMPSON Cleaning MSH3125-S is no different. Right from the start, I was in search of a powerful pressure washer that gives me power, mobility, and heaps of features all in one package regardless of the price. SIMPSON Cleaning MSH3125-S is what I needed. Multiple Attachments: To make things easier for the user, the SIMPSON Cleaning MSH3125-S comes with various attachments that you can use. On-Board Storage: Users can store both the hose, as well as the gun on-board. Siphoning Tube: The SIMPSON Cleaning MSH3125-S comes with a siphoning tube for detergent. Thermal Relief Valve: The pressure washer comes with a thermal relief valve that makes sure there is no overheating. Judging by the size of the washer, you might think that this is going to be a pain to carry around, thankfully that is not the case as the washer comes with two 10-inch pneumatic tires that make the job much more comfortable, that coupled with a steel frame, and you have everything in order. However, the star of the show is the motor that is capable of giving 3,200 PSI at 2.5 GPM: this configuration makes the SIMPSON Cleaning MSH3125-S the most potent pressure washer on our list so far. 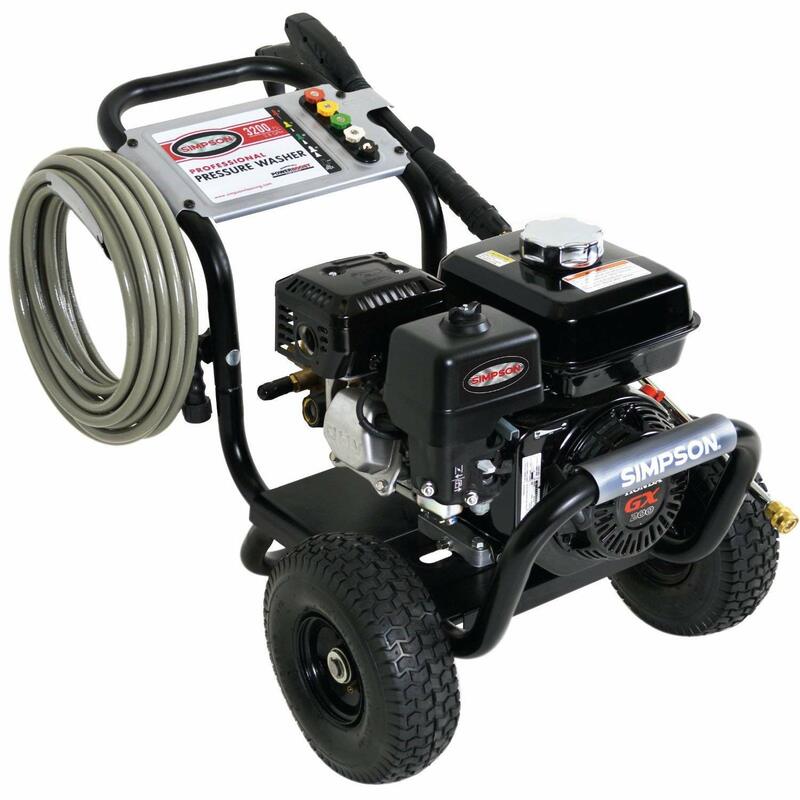 Considering how this pressure washer works on gas, you also get a GC190 Honda engine that is powerful and can deliver incredible performance for your pressure washer to the point that you would not need to look for another one. However, when it comes to pressure washers, I do not think SIMPSON Cleaning MSH3125-S could be bested, at least in the given price range. It is powerful, it is easy to move around, and has a lot of attachments and features that will take care of most of the cleaning needs you have. Overall, I would say that the SIMPSON Cleaning MSH3125-S has impressed me. I am very picky about the power tools I use, and there have been times when I just refused to use even the best power tools in the market. Excellent performance thanks to a mighty engine. Comes with many attachments that make things easier. Can practically clean anything without letting the user down. Starts up in just 30 seconds. Great pressure, making things easier for you. Removes dirt and grime in a matter of seconds. Comes with 5 changeable nozzles for different angles. Great for cleaning all sorts of vehicles, as well as homes, driveways, patios, decks. If you are on a budget, then the then the Ivation Electric Pressure Washer is excellent with enough features. If you go to Amazon or even in the market and start looking for pressure washers, you are going to find countless options available to you. To an average user, it is both good and bad things; good because you will have so much to choose from, bad because you will get confused because of the number of options. The Ivation electric pressure washer is an excellent choice for people who are on a budget but also want some nice features. Detergent System: The Ivation electric washer comes with a built-in detergent system that makes everything easier. Additional Nozzles: You also get five extra nozzles that are made for different uses, making it easier for you. Easy Setup: The Ivation Electric Pressure Washer is among the most comfortable options when it comes to setting up, it only takes a few seconds. High Mobility: The pressure washer offers excellent mobility, allowing you to carry the washer easily throughout the place. Taking a thorough look at the Ivation electric pressure washer, there are many things that you would like. For starters, the washer is lightweight and can be carried easily to anywhere you want. You should also know that the same washer is available three versions; there are two smaller versions available, but we are reviewing the best one available in the market. Both the hose and the power cord of the washer are long enough, so you can just set the washer on an optimal position and from that point, you can move around as much as you want. Looking at the overall construction, it seems that Ivation cut some corners with the build quality as it is mostly plastic, and I fear that it might break. As far as the mobility is concerned, this gets full marks because there is nothing that hinders the mobility and cleaning of this pressure washer. Increasing the portability, you need to understand that the pressure washer comes with onboard storage for the nozzle, which makes it much better. However, I wish there was storage for the hose as well, but that does not seem to be the case here. Since we are talking about the nozzles, you get five attachments in total, allowing you to customize your user experience properly. There is an automatic stop feature which I find useful because it made everything a lot easier for me, and you do not get the ease of access that easily. The function means that it will stop the washer completely, allowing you to not worry about anything. If you are okay with the build quality being average at best because you are mainly concerned with the performance of the pressure washer, then the Ivation Electric Pressure Washer is a great option that you should go for, It is indeed well worth the money. Cheap and works as intended. Easy to set up, and even easier to handle. Users get five extra nozzles that are made for different purposes. Lightweight construction makes it easier to carry the washer around. Primarily made of plastic, which makes the build quality average at best. Has a large 1.2-liter detergent tank. You can change the nozzles with ease. Long pressure hose allows for easier cleaning. Powerful motor delivers fantastic performance. Energy Saving Mode: Automatically switches off the pump. An upgraded version of SPX3000 that provides better build quality as well as a hose reel. If you remember, I raved about the Sun Joe SPX3001, despite checking out so many pressure washers, the SPX3000 remains one of my favorite pressure washers. Sturdy Motor: The SPX3001 continues the tradition and comes with a sturdy 1,800-watt motor capable of delivering a 2,030 PSI at 1.76 GPM pressure. Automatic Stop: The pressure washer comes with a feature that stops the motor when the trigger is not being pulled. Built-In Detergent Tank: The pressure washer also comes with a built-in detergent tank that can easily contain the detergent without any issue whatsoever. Built-In Storage: Another benefit you will get from SPX3001 is that there is built-in storage that allows you to store pretty much everything like the hose, spray gun, wand, as well as the power cord, making the SPX3001 super-compact. As far as the feature set is concerned, the SPX3001 is impressive as they get, however, let’s not get ahead of ourselves. Well, the good thing is that the performance on the SPX3001 is outstanding. The powerful motor makes everything easy and straightforward to do. You can clean whatever you wish to clean without any issue whatsoever. The total stop system is also a convenient feature, because it stops the motor on its own, meaning that the motor will not rotate and consumer electricity for no apparent reason, this is the feature that I would like to see in more pressure washers. In addition to that, I love that there are different nozzle types, making everything much more comfortable for the user as well because you now get multiple ways of cleaning whatever you want to clean. The one thing that I did not like about the SPX3001 is that the hose reel is a bit uncomfortable to use, and can create some clumsiness. However, that could very well be completely subjective as I did not see any other reviews stating the same thing. The onboard detergent tank is another plus point about this pressure washer because you can simply add as much detergent as you want in the container with 1.2 liters being the max capacity, this allows for thorough cleaning without having to worry about running out of detergent. 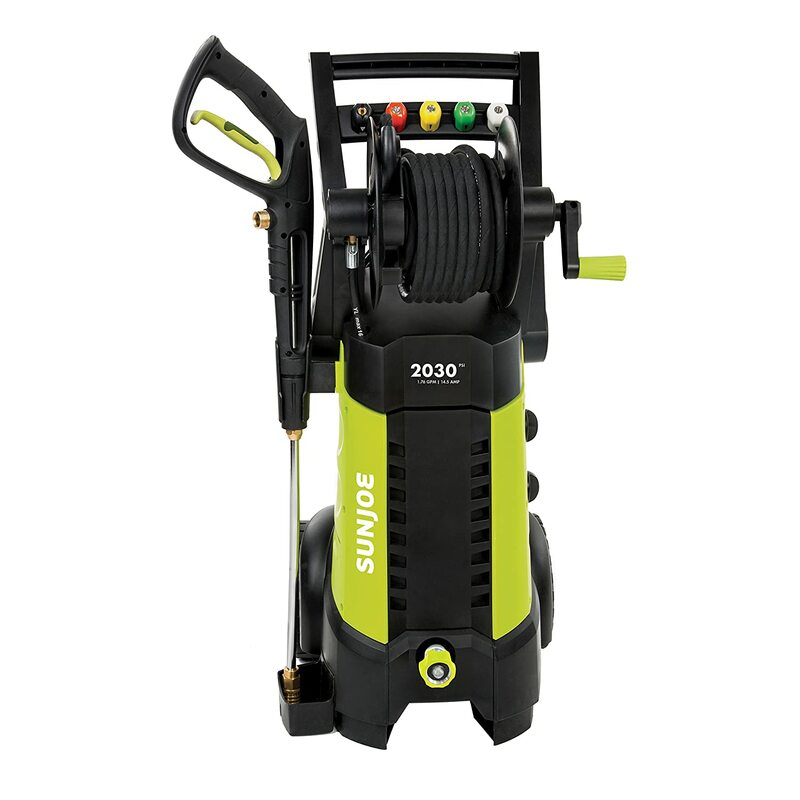 The previous version Sun Joe SPX3000 was a fantastic pressure washer on its own, so I was a little skeptic about just how good the updated version is going to be. The good thing is that my expectations have been defied because the SPX3001 is one of the best pressure washers you can buy. Sure, it may not feel like a substantial upgrade, but it indeed is a great buy. Build quality is solid as ever. Two years warranty is a plus point. Plenty of features and attachments make the experience much easy. Some users might have an issue with the hose reel, but not everyone will. 4-wheel design allows for easy mobility. One of its kind pressure washer in the market. The Karcher K3 Follow-Me is perhaps the most portable pressure washer you can buy even on a budget. The one thing I noticed among people who are looking for pressure washers is apparently the need for portability. Apparently, the higher the portability, the easier it becomes to move the washer around. Same is the case with the Karcher K3 Follow-Me that is built around providing the maximum amount of portability, making it a great option to buy. 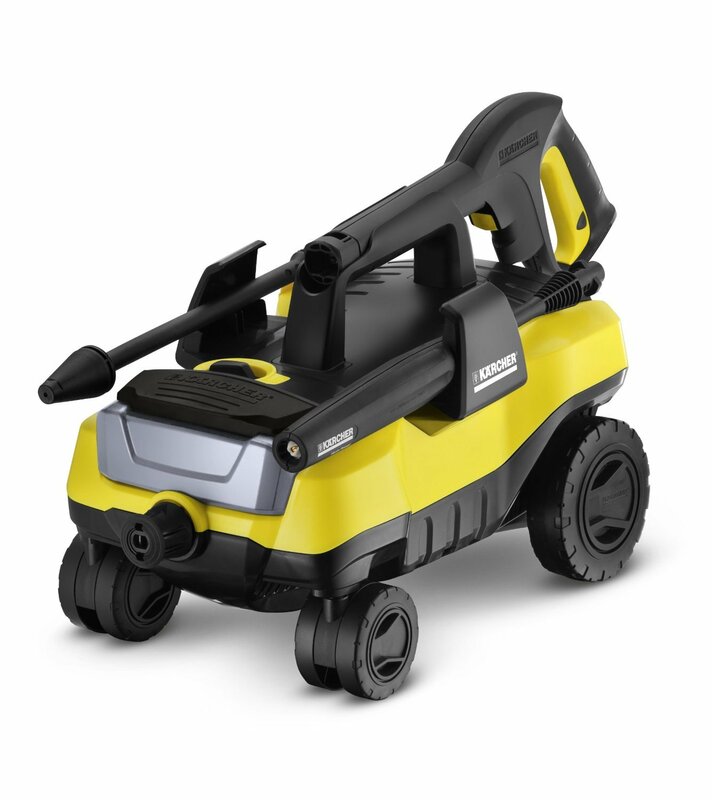 Portable Design: The Karcher K-3 Follow-Me an incredible design that makes it one of the most portable options that you can buy in the market. High Pressure: As compared to the traditional garden hose, or a hose in general, the washer delivers excellent pressure without any issue. Compact: You can easily store the pressure washer anywhere you want whenever it is not in use. Now onto the stuff that matters. Honestly, I was not sure what to expect from the Karcher K3, the pressure washer is the smallest I have seen, and from the looks of it, you do not ever think that the performance is going to suffer. However, the good thing is that I was proven wrong in no time. In reality, the Karcher K3 Follow-Me is an excellent pressure washer. However, it does feel like it is made for a niche audience because not everyone is going to need a power washer that is not powerful enough. Comparatively, the K3 has lesser pressure, meaning that it will not be suitable for all the cleaning jobs. For starters, you do not get access to any additional nozzle attachments, meaning that you are pretty limited to what you can clean with the attachment you have. The cleaning angle is also small because of the stock nozzle, and the overall pressure of the washer is not a lot either. Lastly, I also found the hose to be smaller than what I would prefer. The good thing is that the lightweight and compact nature of the pressure washer makes it a handy power tool for most of the situations. It can quickly clean a variety of surfaces, but the pressure is not as high, so keep that in mind before you start cleaning some tough stains. Thankfully, the pressure hose does not tangle with the power cord, which is a common issue in most of the pressure washers that I have reviewed. Overall, I can only say that the Karhcer K3 Follow-Me is built for people who are not looking to spend much money on a pressure washer, as well as people who want a pressure washer that is portable and can easily be tucked away. It might not sound like an ideal choice, but it can handle all the tasks it is designed for with great ease, as long as you do not pit this against tasks that are not for this specific for this type of pressure washer. The pressure washer is easy to use. The hose and power cord do not tangle. Offers a decent pressure and performance. Can easily be carried and tucked away when not in use. The pressure is not all that strong. The hose is smaller than what you would typically prefer. You can adjust the spray wand easily. Uses cold water to clean more effectively. Great flow rate of 1.45 gallons per minute. Great for light or moderate cleaning jobs. The Sun Joe SPX1000 is the perfect electric washer for people who want to have light to medium cleaning. Right out of the box, it is a tell that the SPX1000 is built for people who are looking for a pressure washer that is affordable for everyone, and especially people who do not need something heavy duty because their cleaning requirements are not limited to those. As long as you only want to do light to moderate cleaning, the SPX1000 is an excellent option for you, because it will help you with the cleaning process. Adjustable Wand: The one thing I love about the SPX1000 pressure washer is that the wand is adjustable at best, so you don’t have to worry about that much. Controllable Pressure: Since this pressure washer is built for light to medium tasks, the pressure control allows you to easily control pretty much everything without an issue. Easy to Carry: The small size of the pressure washer allows the user to easily carry the washer wherever you want without any issue whatsoever. I was already aware of most of the things about the Sun Joe SPX1000 because this is not the first Sun Joe pressure washer that I am using. I had used and reviewed two of the pressure washers from the same company before and loved them. However, the experience was slightly different as this was my first time using a low powered, budget-friendly pressure washer from Sun Joe. The great thing about this pressure washer is that this is one of the quietest pressure washers I have used. Whether you are near the unit or at a distance, you will not hear a lot of noise, which is fantastic because most of the units that I have tested made a lot of noise, especially the more powerful ones, but this does not make as much noise. If there is one thing that I don’t like, it is the fact that the hose on the pressure washer is smaller than what I would have preferred, but considering how the pressure washer is not made for reaching heights, this shortcoming is more than understandable. Overall, the Sun Joe SPX1000 is a great pressure washer as long as it is being used for the right task. The pressure is low, I get it, but so is the price. Plus, the company is stating that it is for people who do not have any heavy tasks to do with this pressure washer. How hard could that be to understand? You can control the pressure of the water. The pressure washer is incredibly quiet during operations. The pressure washer is exceptionally lightweight and easy to use. The quick-connect feature is the best I have seen on any pressure washer. There are no additional nozzles included in the pressure washer. The hose is somewhat shorter than what other pressure washers offer. Has a built-in tank for detergent. Long power cord allows you to connect it easily. The garden hose adapter is built from aluminum. You get 30-foot pressure hose that comes with a functioning hose reel. The AR Blue Clean AR390SS is the best washer for anyone who is looking for removing hard stains. 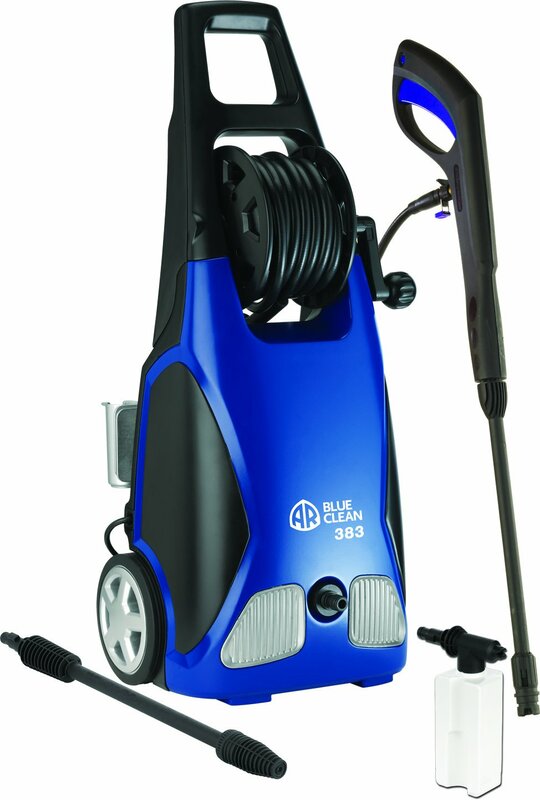 The AR Blue Clean is back with another pressure washer, and this time, we are looking at the famous AR390SS. Yes, all the pressure washers from AR Blue Clean come with a slightly confusing name, but I can assure you that this is indeed one of the best pressure washers that you are looking for in the market, and should serve you well too. Long Hose: One of the most prominent features of this washer is that it offers long hose that makes cleaning much more comfortable. Built-In Detergent Tank: You also get a 48oz detergent tank that will help you store all the detergent necessary for cleaning. Great Warranty: The AR390SS also comes with great warranty that should help you be at peace. Now the good thing about the AR Blue Clean AR390SS is that it is very effective at most of the jobs that you would throw at it. Sure, you might think that it is not suitable for stain removals, but after thorough testing, I can assure you that it is terrific and effective, to say the least. Whether you are removing stains or doing an overall cleaning job, it is effective and works well at all the ranges. Another great thing I love about the AR Blue Clean AR390SS is the quiet operation that you get from it; this needs to become more common in the pressure washers because most of the pressure washers that I have used are very loud. With this, you are in luck as the operating noise is as quiet as it gets. While there are a lot of positive things about the AR Blue Clean AR390SS, there are a few things that I wish were a bit better. For starters, the cleaning power is pretty good, but the angle itself is a bit average and might end up causing an obstacle in the overall usage. The overall ease of access that you get from the AR Blue Clean AR390SS is also excellent; the washer is easy to use and control without getting into a lot of technical details. Not to forget, the mobility is worth it. Last but not the least, I love that you get the feature to replace the nozzles with ease, something you do not often see in pressure washers. In conclusion, if you are okay with the one minor gripe, then the AR Blue Clean AR390SS is a great option that you should check out if you are looking for a good pressure washer. I can assure you that there will not be any problems as far as the usability is concerned. You can replace the nozzle tips with ease. The pressure washer is quiet in operations. You can efficiently use it, and store it when not in use. The AR Blue Clean AR390SS is pretty effective with cleaning. While there is enough cleaning power, the cleaning angle is not the best. The spray gun is ergonomic. Comes with 5 additional nozzles. Best pressure washer for people who want a powerful, gas-powered pressure washer. 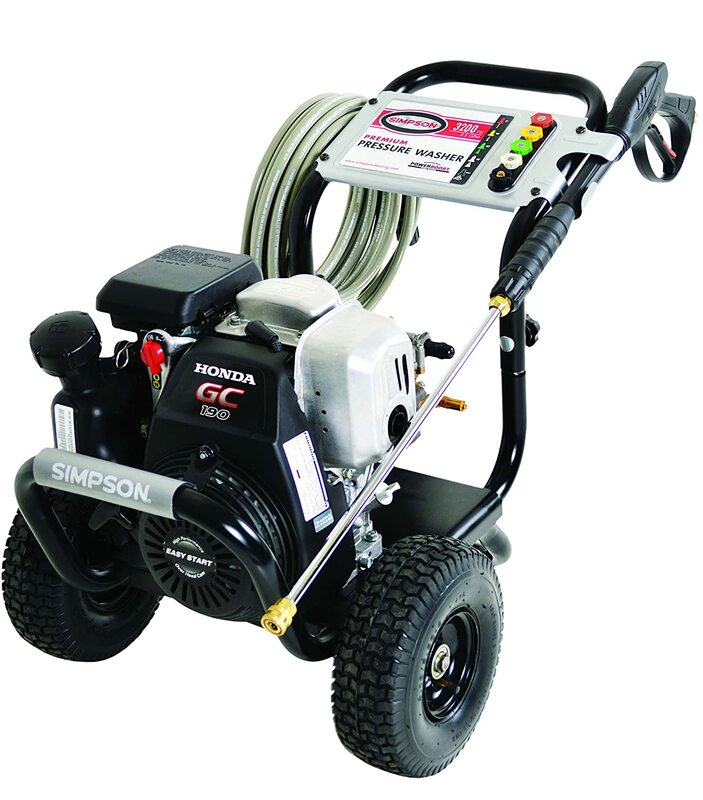 I have reviewed a Simpsons pressure washer before as well, and if you are looking forward to buying one, then I have to tell you that the Simpson are really good with their pressure washers, especially the high-end ones that are powered with Honda engines. The SIMPSON Cleaning PS3228-S is no different, and so far, it is the most potent pressure washer on the list. Mighty Engine: The SIMPSON Cleaning PS3228-S uses a powerful Honda GX200 OHV engine. Great Tires: The pressure washer comes with two 10-inch pneumatic tires. Best in Class Build Quality: The SIMPSON Cleaning PS3228-S has a welded steel frame complementing the powerful engine. Judging by the features alone, one can attest to the fact that the SIMPSON Cleaning PS3228-S is not playing around when it comes to being dominant. The engine is capable of providing 3,200 PSI pressure along with 2.8 GPM; this is some serious raw power that this pressure washer has. So much so that it can take care of pretty much all the stains that you want it to remove without really taking much time. Both the power cord, as well as the hose are super sturdy, so you will not have any issues with mobility if that is what bothers you. I would say that the SIMPSON Cleaning PS3228-S is a great pressure washer as far as the mobility is concerned, and this is a surprise because the sheer size of this pressure washer is worth keeping in mind. The one thing that I would say that I did not like is that the engine is way too powerful, and while power is not the concern or the problem here, the problem is that the engine will outlast the pump itself. Which means that the pump will need to be replaced after a while because the engine itself is going to outlive the pump, which is completely fine. All in all, I love how the Simpson has done a great job in making the SIMPSON Cleaning PS3228-S, it is one of the best, if not the best pressure washers in the market. It works well for every single situation, and I can assure you that you will not be disappointed at all; that is a given. NOTE: Make sure that this pressure washer actually serves your requirements because it is seriously an overkill, and ONLY FOR THE HEAVY USERS!! The 3,200 PSI pressure coupled with 2.8 GPM is incredible. The Honda GX200 OHV is a potent engine and works really well. The pressure washer speaks quality as the frame is made out of welded steel. Both the hose and the power cord are pretty long, so you will not have any issue whatsoever as far as the mobility is concerned. The engine will outlive the pump, which means that you will need to replace the pump before anything ever happens to the engine. Power saving, 13 amp motor. 1.2 gallons per minute output. 20-inch hose allows for easier storage and mobility. The Greenworks 1500 PSI 13 Amp is the best pressure washer for people who are looking for something small. 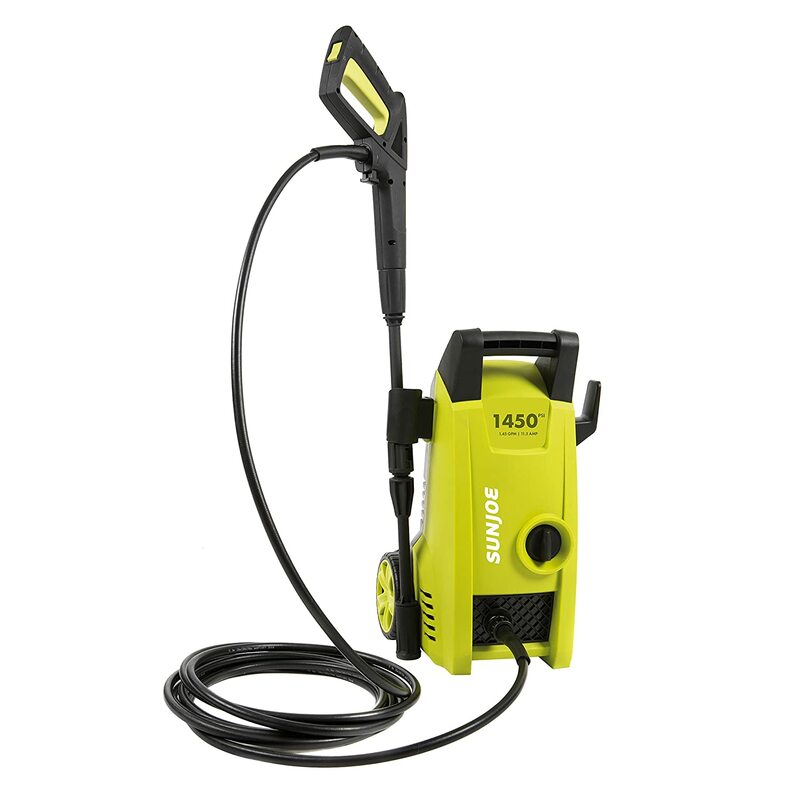 If you are in a market looking for a pressure washer that is small, compact, easy to use, and can easily be carried around like a backpack, then I would suggest buying the Greenworks 1500 PSI 13 Amp. In all honesty, the Greenworks 1500 PSI 13 Amp did not let me keep my expectations high. 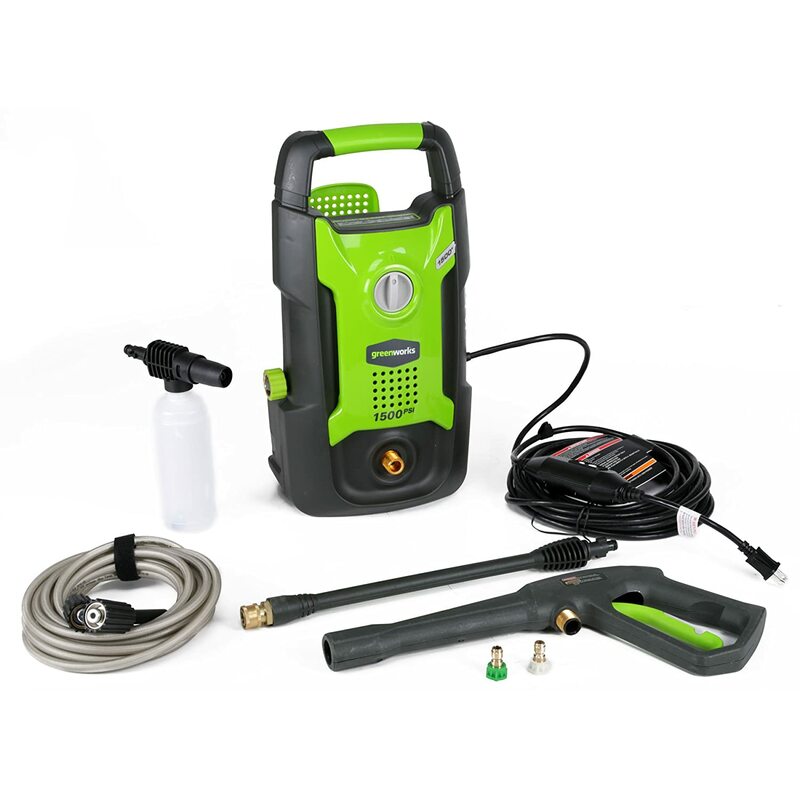 Easy Portability: The Greenworks pressure washer is excellent for portability, so that should not bother you at all. 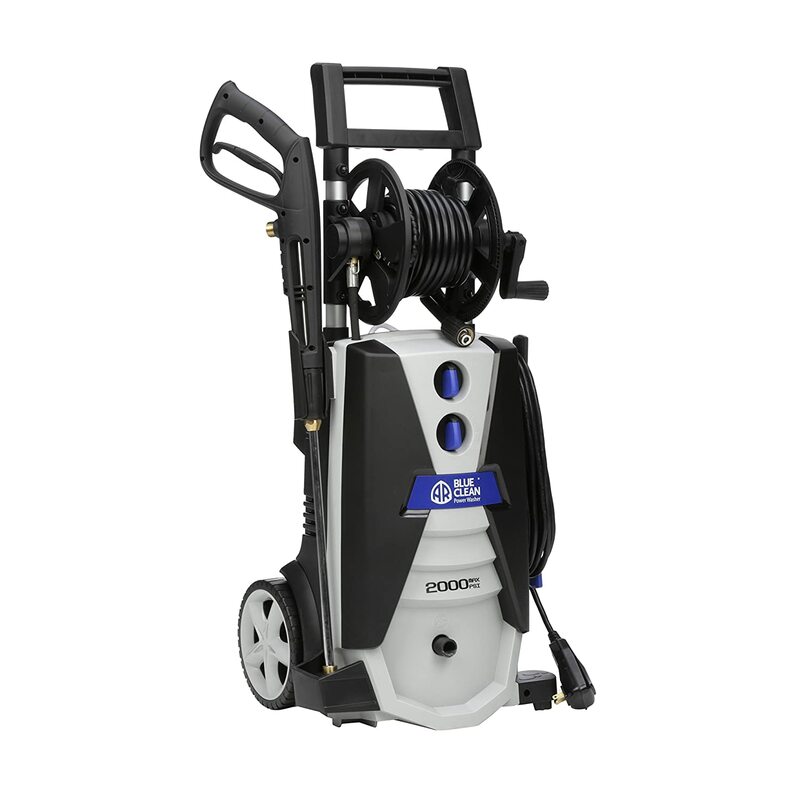 Quick Connect: The pressure washer has a quick connect feature that will allow you to quickly connect the hose and the nozzles without any issue whatsoever. Easy to Use: Another great feature is the fact that the Greenworks 1500 PSI is extremely easy to use without really having a lot of technical knowledge. My first impressions of the Greenworks 1500 PSI 13 Amp were not positive, because I thought that the pressure washer would not be able to hold its own against the competition. That is mainly because it was way simpler, and looked flimsy. However, I forgot that this was made for specific purposes like cleaning your car, or your house, and even your backyard with this pressure washer, making it the ideal choice. The only thing I did not like is the fact that the pressure washer comes with a motor that is way more underpowered than what I would prefer. For those who do not know, underpowered engines mean that there will not be enough pressure, which in many cases, is not acceptable by many people. All in all, the Greenworks 1500 PSI 13 Amp is not a bad pressure washer at all. As a matter of fact, given the price tag of this pressure washer, you are getting a lot of features, which is not a bad thing at all. So, you should keep that in mind whenever you are in the market looking for a decently priced pressure washer that you want to use for cleaning your car. The pressure washer is among the easiest to use. You get the quick connect feature which is excellent. The pressure washer offers a decent enough performance. If you are going to the market to look for a pressure washer, or even if you are shopping online, I have to tell you that there are going to be several options at your disposal. This is not a bad thing at all, because having options is always a good thing, but it is also important to keep in mind that whenever you are buying a pressure washer, you need to be completely sure, because otherwise, you might end up buying a pressure washer that is not all that useful for you. This buyer’s guide is for people who are not familiar with the buying process of a pressure washer. There are so many options, and these pressure washers are used for so many different purposes, it is really easy to get confused and have a mix-up. Hopefully, this buyer’s guide will make things easier for all the buyers who are confused, or feeling overwhelmed due to the sheer number of options you have available. The first thing that I would advise you to consider is knowing that you want to clean. I know it sounds weird, and out of place, but if you know the primary use of the pressure washer it becomes much easier for you to decide. For starters, you do not want to clean your car with a super high power pressure washer because that would not make much sense at all. Similarly, you do not think you can clean the tough stains on your wall using a portable power washer that does not have enough power, right? Works best for removing mild mold. Great for minor, or random cleaning jobs. Meet the residential electric requirements. Perfect for jobs like washing cars, cleaning shutters, cleaning spots, lawn, grills, or other lawn furniture. The gas engine models have a pressure range of 2,000 PSI, and all the way up to 3,000 PSI with a maximum GPM of 2.8. Meets the residential gas grades. Great for decking, pavements cleaning, as well as sidewalks, and overall stains that are tougher to remove. On the last, you have the professional gas engine models; these range from 3,000 to 4,000 PSIs, with a maximum GPM of 4.0. They are made for professional grade usage. They are best for heavier jobs that require proper cleaning. Mainly made for industrial level cleaning of things like concrete, pavements, siding, paint stripping, removing graffiti as well as very stubborn stains, and mold. So, before you make your decision, just consider what you want to clean beforehand, and you will be able to buy the right pressure washer without any issue whatsoever. Another essential thing that you need to consider whenever you are in the market looking for a pressure washer is the size of the pressure washer. I say this because pressure washers are available in different sizes. You get the super portable ones that are almost the size of a backpack, and then there are medium-sized ones, and lastly, you get the big ones that come with a steel frame and pneumatic tires. The simplest way to make the right choice here is knowing the task you are going to handle with the pressure washer. Once you have figured that out, you can buy the pressure washer that fits your requirements. Going through this review, you are going to see terms like PSI and GPM being used a lot. That is because these are standard terms in pressure washers. If you are wondering, what PSI is, it is pounds per square inch of pressure. The higher the PSI, the higher the pressure of the water that comes out of pressure washer. In addition to that, one more thing you need to consider is the GPM, and that is gallons per minute. Again, the higher the GPM, the more the water will come out. You should know that if you do not want to buy a pressure washer for more large tasks, then buying one with lower PSI and GPM is not that bad at all. Another important thing that I would ask you to consider whenever you are in the market looking for the best pressure washer is making sure the power source of the pressure washer. Do you want to buy a pressure washer that is powered by electricity, or do you want a pressure washer powered by gas? 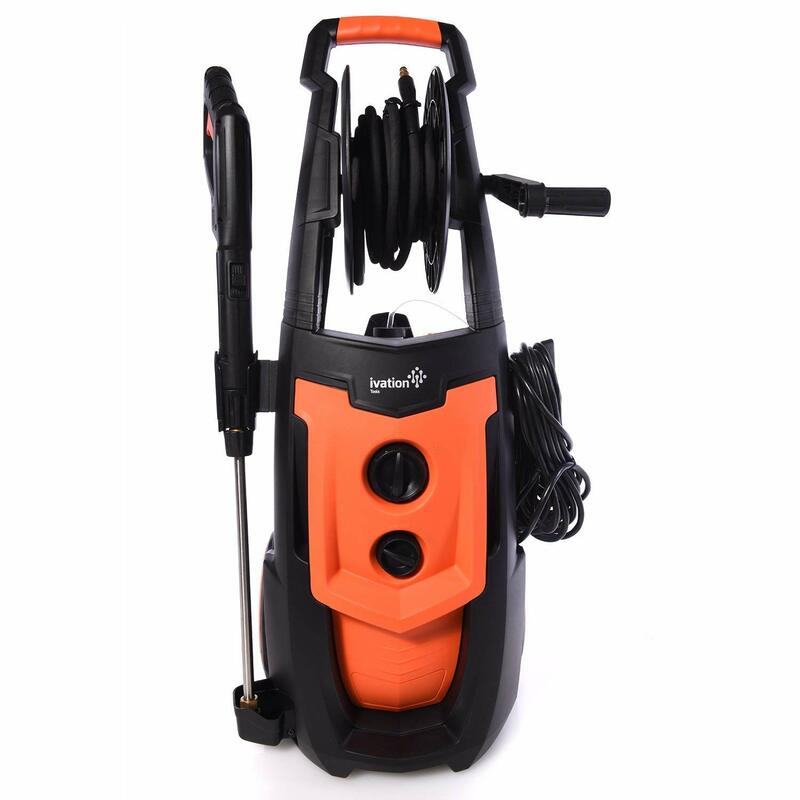 Now here is the simplest thing to understand, if you are looking for a small to a medium-sized pressure washer, then you are going to buy the electrical one. But if you are looking for the larger sized version, then the best option would be to go for the gas powered one since those don’t come in electrical versions, because of the power draw. IMPORTANT: Kindly wear heavy shoes or boots when using a Pressure Washer. Injuries and infection risks from accidentally injecting your feet with high pressure water can be very serious and painful. Testing these fantastic pressure washers have been a fun thing to do, however, at the same time, it did feel like a chore because some of them were less than helpful as compared to the others. However, at the end of the roundup, I can only say that I managed to make sure that almost all the best pressure washers that are available in the market get adequately tested because otherwise, there is no point in actually buying a good pressure washer. There were some of the pressure washers that stood out the most, especially by Simpson, as they were way too powerful. However, thanks to pressure washers like the Greenworks, it all made sense and the overall roundup was appropriately balanced. In conclusion, I would only like to say that I hope this list helps you find the best possible pressure washer you are looking for. Sure, you might find more suggestions on the internet, but if you are not in the mood to randomly scroll the web finding the right solution, then this is the right way to go. In case you think the list could have had more options added, feel free to let us know your suggestions in the comment section, and we would love to have a look at them. Fed-up of washing your dishes by hands? Let the finest dishwashers do the job for you. This is so informative article on pressure washer, just loved the review and glad I was able to find this article. Thanks for the sharing the wonderful review about the best pressure washers, It’s really helpful. In this article I know something different. Most of the time I came your website and read your all post. Last few day I was facing some problem about pressure washers. Recently I wanted to use pressure washers but I didn’t know anything about this. But reading your article I know everything. What product I should buy?